Funding day-to-day operations is a persistent challenge for U.S. small businesses. A recent S&P Global Market Intelligence survey found that, over the past two years, small businesses in the U.S. sought lending primarily to finance working capital needs. Fintech companies are stepping up, and using innovative methods, to meet the demand. Several fintech companies are using data from non-lending relationships to become larger providers of working capital. As these lenders integrate further into their customers’ businesses, they will use their position to issue fast approvals and provide non-conventional loan products, chipping away at market share held by longstanding players, including banks. Fintech companies in the payment space have become active lenders in recent years, using their access to clients’ real-time cash flow data to provide them financing. While their offerings vary, a number of these newer lenders provide merchant cash advances, or MCAs, which establish a fixed total repayment amount and allow borrowers to determine what percentage of their card transaction volume to put toward their balance. The payment company deducts this percentage from every card transaction until the full amount is paid. This effectively turns debt servicing into a variable cost that fluctuates based on the level of sales activity, though most lenders require some form of minimum payment amount. PayPal Holdings Inc. and Square Inc., two of the largest companies in this sector, have used customer data to underwrite loans and make a splash in the marketplace, originating more than $5 billion in loans since 2015. In 2015, Bryant Park Capital LLC estimated the total annual origination volume for the MCA industry, which is composed of hundreds of lenders, at $10.7 billion. This kind of practice is not new. Merchant cash advances blossomed in the early 2000s but the entrance of fintech companies arguably marks an evolution, in terms of company scale and technological sophistication, in an industry previously dominated by private specialty lenders. Incumbents such as Rapid Financial Services LLC and Strategic Funding Source, Inc. are sizeable competitors, but they do not offer the same range of services as payment companies, nor do they integrate into their customers’ business processes in the same way. Merchant cash advances have received negative attention in the past due to the high effective rates charged by lenders, with annual percentage rates often coming in the high double digits. Moreover, a period of better-than-expected revenue could actually increase the annualized yield paid by the borrower since the total payment amount is fixed. Given the onerous terms, most MCA providers targeted borrowers who could not obtain traditional financing or who simply needed cash very quickly. Fintech companies will try to combat this narrative with the convenience of their service and, possibly, lower pricing. 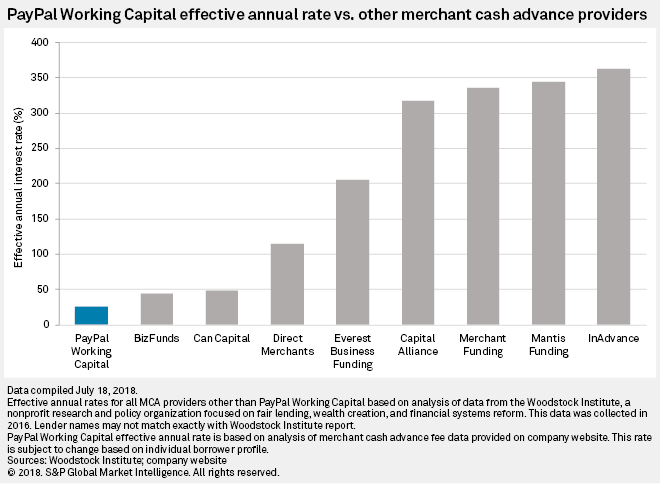 Paypal Working Capital, for instance, bases fees on an annual percentage rate that is significantly lower than many other legacy players in this sector. Integrations with small business software are not restricted to payment terminals. Several digital lenders link to borrowers’ bookkeeping software, like Xero or Freshbooks, to ensconce themselves in the real-time flow of their customers’ businesses. And just like in the payments space, some service providers are leveraging their existing relationships and data access to offer financing themselves. Intuit Inc.’s QuickBooks and competitor Zipbooks, two bookkeeping software providers, both offer working capital financing to eligible customers. A number of national banks have taken notice of fintech companies moving into small-business lending and many have already launched projects to ease the process of funding working capital. Fundation Group LLC, a digital lending platform that offers customers fully automated online lending applications, has partnerships with regional institutions including Citizens Financial Group Inc. and Regions Financial Corp.
Banks still have some fundamental advantages, including access to cheaper funding than digital lenders. Any small business with the ability to qualify for a traditional bank loan would likely benefit from lower rates. Trust also remains important to borrowers, and banks still seem to have the advantage there. Our survey shows 42.1% of respondents citing an existing relationship with another lender as a reason for not applying for a loan from a digital lender. However, nearly 50% of borrowers cited unfamiliarity with digital lenders as a cause of their aversion, suggesting that marketing and customer education may be just as large a hurdle as bank loyalty. As part of their marketing, many fintech lenders extol their ability to service customers through digital channels without using physical bank branches. Using their proximity to customer data, these fintechs have already become large players in niche lending markets. This trend toward integration will likely continue as new players enter the market and current ones look to expand further. 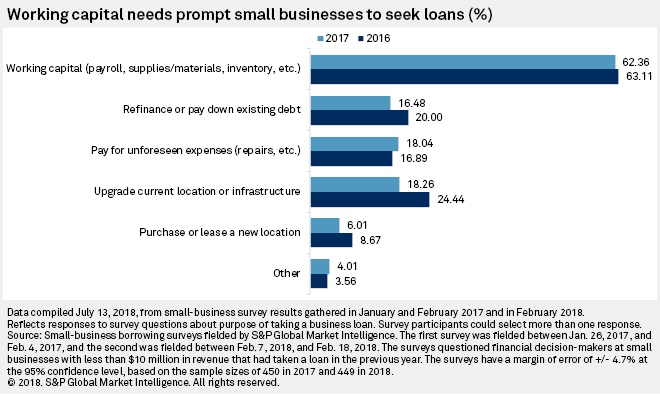 S&P Global Market Intelligence’s 2018 Small Business Borrowing Survey was conducted between Feb. 7 and Feb. 18 across a nationwide sample of individuals who make borrowing decisions for a small business. Small businesses were defined as any business with 2017 revenues of $10 million or less. Survey results have a margin of error of +/- 4.7% at the 95% confidence level based on the sample size of 449. Read this article, or, subscribe to S&P Global Market Intelligence to read the full report.